Baingan Restaurant Serves Authentic Northern and Southern Indian Food Baingan Restaurant opened its doors offering a very unique taste of Indian Food. Open seven days a week, the owner and management team are committed to making their customer's visit a truly wonderful and unforgettable experience. Owner Pramod Kandel, have been working in the restaurant field for more than 15 years so they bring a lot of experience to the table. 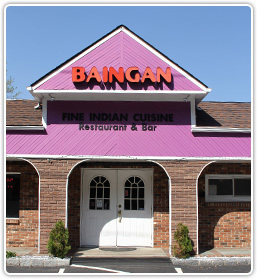 He wanted to open a restauant offering authentic Indian cuisine. After looking at other areas within the surrounding communities for more than a year for the perfect place to open their restaurant, he decided to open it in Shelton. The restaurant is conveniently located at 94riverroad (Route 110) close to Route 8, approximately five miles north of the Merritt parkway. Customers greatly appreciate on the convenience of the location and the great views of the Housatonic River. The restaurant also have a summer patio where you can relax while overlooking the water.The menu consists of a variety of authentic Indian cuisine along with all you can eat lunch buffet ofering North and South Indian dishes randomly from the menu. The lunch on buffet days from 11:00 AM until 3:00 PM, Monday through Sunday. Catering services are also available for all occasions. The restaurant has been getting rave reviews about the food and service. The staff is very welcoming and go and beg on accommodate patrons.